that will make you to look at our world in a completely new way. And we can help you with that! June - August. Car tour "Olkhon Island in one day"
Ask for details from a hotel guide or administrator, using +7 (3952) 60-67-69, or leave an application and we will contact you! Olkhon Island is one of the most beautiful places at the Baikal. Trip around the island will make you think you have travelled halfway around the world! Wide open spaces of Olkhon resemble Zabaikalye; picturesque rocky shores of Khuzhir resemble Krim, view of Sarayskiy Beach make you think you are in Australia and sand dunes of Peschanoe are like the Gobi Desert. After 70km trip you will make sure that Olkhon is like a consolidation of all natural landscapes: from sands to boreal forest. You will visit Burkhan Cape and rock Shamanka, Sagan-Khushun and the northern part of the island – Khoboi. You will not see these magic and breathtaking landscapes anywhere else but here. All these places are sacral; the residents of the island had been holding their sacred rites since ancient times. You will get to know life and culture of indigenous people of the island, you can taste traditional dishes of Buryat cuisine and the national alcohol drink – tarasun. 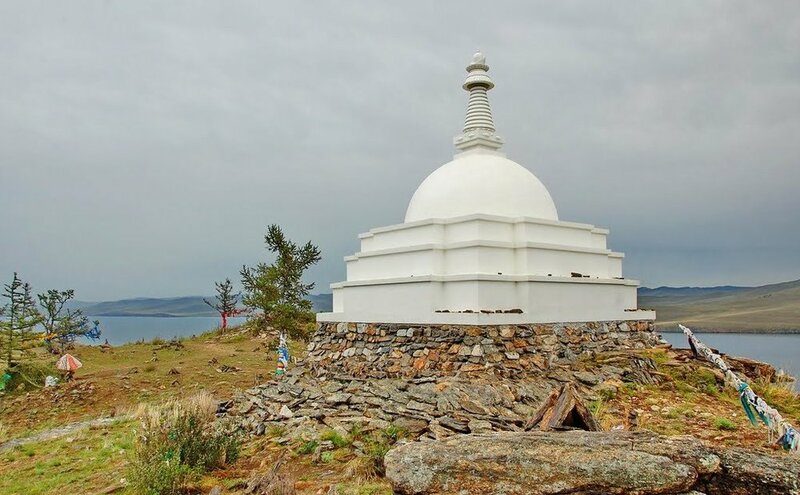 This trip will leave you with a rich store of excellent memories of Olkhon. Buddhist sacred place at Olghoi Island symbolizes world peace. You can see whole Maloe Sea and the eastern part of Olkhon from there. There are about twenty spices of plants registered in the Red Book. You will be dropped off onto Oghoi Island and will get an opportunity to hold a rite at Buddhist stupa of enlightment. There will be voyage throughout Maloe Sea with stoppings at Tainakov Islands, habitats of Baikal seagulls and cormorants. During the trip you will be able to enjoy wonderful view of Olkhon Gates (Sarminkoye Gorge). The tour includes a walk through Sagan-Khushun and a stopping at the Silver Source. Both capes, which you visit during the trip, are protected areas, where you can see yellow poppies registered in the Red Book. Each cape is unique. The bravest tourists can enter the grotto. The Silver Source will let you help to rest your body and soul inside majestic atmosphere of twitting birds and fresh forest air. Water of the Source has medical properties for eyes and silver ion saturation keeps the water fresh for a long time. © The Baikal Resort "Da-Shi".